As German troops approach Paris, a young German refugee named Georg (Franz Rogowski) flees to the French port town of Marseille. In his possession are documents that belonged to an author named Weidel, who committed suicide. Assuming Weidel's identity, Georg has his manuscript, letters and visa assurance from the Mexican embassy. In Marseilles, Georg meets a young woman named Marie (Paula Beer), who's desperate to find her missing husband – the very man he's impersonating – in order to get help in getting out of France. Without letting her know he has Weidel's papers, Georg tries to help Marie, with whom he's quickly fallen in love. 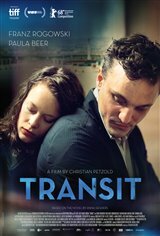 Based on the novel Transit Visa by Anna Seghers. In German and French with English and French subtitles.